Jump into a Kundalini yoga practice to recharge yourself and revitalize your life! In this incredible one-hour class, Snatam Kaur leads you through a Kundalini yoga practice to get your energy flowing so you can live the life of your dreams! Snatam Kaur's class focuses on restoring the pranic energy in your body, the vital life force that supplies you with energy, power and the courage to embrace your destiny. With powerful pranayama or breathing exercises, an invigorating experience with Archer Pose, and a kriya to recharge your physical and energetic self, you'll come out of this class empowered and rejuvenated body, mind and soul! Snatam Kaur is joined by the angelic Ajeet Kaur on vocals with tablas by Sukhmani Rayat and accompaniment by Siri Kirtan Carlisle. 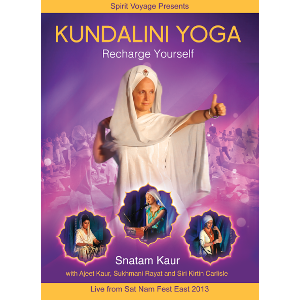 Experience the power of kirtan and Kundalini yoga together in one dynamic class, filmed live at Sat Nam Fest!